Celiac disease is an autoimmune disorder. A person with this disease is unable to process gluten (a protein found in wheat, barley, and rye)—eating something with gluten will cause damage in the small intestine. According to the Celiac Disease Foundation, approximately one in every 100 people is affected by celiac disease, and many Americans are undiagnosed. On National Celiac Disease Awareness Day, organizers hope to raise awareness of the disease and of those who suffer from it. On National Celiac Disease Awareness Day, people are encouraged to learn more about gluten and how to create delicious gluten-free dishes for their friends and relatives. On the days leading up to National Celiac Disease Awareness Day—and even in the days and weeks to follow—it’s great for people to have reminders of the dangers of the disease. A great reminder is a visual one—a wearable, noticeable silicone wristband. Latex-free, these bracelets can be the perfect accompaniment to any National Celiac Disease Awareness Day event. They can be made in any eye-catching color and can have special messages imprinted, such as "Go gluten-free" or "Be aware of celiac disease". These wristbands can be used as fundraisers or simply as giveaways at events—people of all ages will love them. 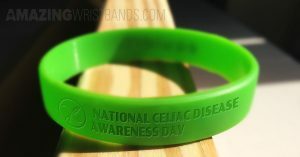 Especially wearing green wristbands with personalized message would be a great way to support Celiac awareness. Why Buy National Celiac Disease Awareness Day Wristbands from Amazing Wristbands? Amazing Wristbands is a leading provider of customized silicone wristbands available online, including National Celiac Disease Awareness Day bracelets. Our wristbands are comfortable, durable, and non-allergenic, made of 100% silicone. Many of our wristbands can be created with our easy-to-use online tool. In addition to standard wristbands, we also offers super popular slap bands that “snap” to a person’s wrist, as well as half-inch bands, thicker one-inch bands, adjustable bands, USB bands, silicone rings, and silicone key chains. Build your own National Celiac Disease Awareness Day wristbands online!